Jelly and jam is a traditional favorite among many. Frequently smeared over bagels, toast, sandwiches, and other breads, this sticky, fruity spread is a household ingredient used in variety of applications. Because so many enjoy this tasty treat, the likelihood of it being finger painted onto the carpets or globs dropping into heaps are fairly high. In any case, having the jelly or jam falling on the carpet is something that needs to be dealt with as soon as possible and we at Leading Carpet Cleaning would like to list an effective method on doing just that. 1) Before you clean up the jelly/jam spots, remember the following key points in carpet care. –	Never let the spill linger, it will only make it harder to get out. –	Never over saturate carpets, doing so could lead to water damage including mold. –	Never use hot water; it could set the dyes into the carpet permanently. –	Never skip the patch test for any cleaning product you use; carpet cleaners or DIY solutions. It could compromise the integrity of the carpet and/or the color. –	Never use colored or printed paper towels, rags, cloths, or towels; it could transfer to the carpet. 2) It is important to take action quickly as mentioned. Like with any substance that makes contact with your carpets, jam and jelly needs to be promptly treated to avoid potential stains. The longer it sits, the more challenging it is to remove. Grab as many paper towels as you think you might need and a dull edged tool, like a spoon or butter knife, and gently scrape the bulk of the jelly and wipe off on the paper towel; repeat until all the blobs are removed but be careful not to push the jam deeper into the fibers or spread them out further. 3) Moisten the inflicted area with a damp cloth or lightly mist the area with water from a squirt bottle. 4) An effective solution to dissolve the sticky residue and remove the jelly/jam coloring is 2 liters of cool water combined with ¼ tsp liquid dish soap well mixed in a bucket or squirt bottle. 5) Administer the solution to a clean cloth, paper towel, or sponge, and begin blotting the jelly/jam blemish. Start patting the perimeters and work your way towards the center. Some find it easier to treat a cloth with the solution and place it over the spot, and using a spoon to press up the jelly. 6) Use dry paper towels or cloth to blot the moisture in between cleaner applications to avoid over saturation and repeat until you are satisfied the stain is lifted away and there is no sticky residues. 7) With separate damp cloth from cool water, blot the solution remnants from the carpet. 8) Use a dry towel to pull up as much as moisture as possible. If it is fairly wet, put weights on top of the towel and leave it a few hours. 9) After the area is completely dry, hit the carpets with the vacuum to relax the fibers. Treating any stains can be difficult. If you are finding that the jelly or jam stains persists, call out Leading Carpet Cleaning and let our trained professionals not only get the stains out from your carpets, but clean the deeply rooted dirt and neutralize odors. All one in the same; colas, sodas, and pop stains are a problem. They are difficult to remove and the longer they set in, the harder they are to get out of your carpet no matter which name you use. Today, we at Leading Carpet Cleaning would like to relate some steps and advice on how to remove the soda stains from your carpets and this method also is just as effective on upholstery and rugs as well. 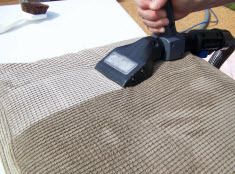 The sooner you treat the spill, the easier it will be to remove and no matter if you decide to use carpet stain remover from the department store or a homemade solution, never skip the patch test done in an inconspicuous area to ensure it will not compromise the integrity or the color of your carpet. The Formula (Optimal for Red, Orange, or Purple Soda): Mix together two cups of cool water, one cup white vinegar, and one TBS liquid dish soap in a squirt bottle or pale. For caramel colored sodas like cola and root beer, a dry cleaning solvent is ideal. Be sure to follow the label’s directions. Quick Carpet Stain Reminders: Avoid over saturation, water damage can occur, if necessary; use a dry cloth in between applications to contain the moisture. Never use hot water or steam machine or the stain could set. Avoid over using the liquid dish soap because too much could leave a filmy residue that attract dirt and grime that is also difficult to remove. Do not scrub or rub because it will just push the soda wider and deeper into the fibers, only blot and pat. Only use white cloths, towels, and paper towels to avoid transferring dyes and prints onto the carpet. 1) If the stain is fresh, use paper towels to absorb the excess soda from the carpets. If the soda is dry, or after the spot is left damp, apply the solution to clean, white cloth and begin blotting the stain. In between applications, use paper towels to contain the moisture. 2) Until the stain has faded, repeat. You may have to rinse out the cloth as you absorb the soda. 3) Use a damp cloth of pure water to rinse the solution residue, once the soda has seemed to be removed. 4) With a dry towel, dry the area to the best of your ability after you have thoroughly rinsed the area. 5) Administer rubbing alcohol to a few cotton balls and dab the stain to pull out the remainder stain out of the carpet in the event a stain is visible once the carpet is fully dry. 6) Mist lightly the area with a spray bottle of water and blot the alcohol residue. Place another dry cloth on top and add weight to pull up the slight moisture to ensure it is left only minimally damp. 7) Vacuum the area once it is completely dry. If the stain persists, you can add few tablespoons of hydrogen peroxide and ammonia to the above mixture and repeat the procedure, however, please be aware that these chemicals have the capability to lighten the carpets coloring and can potentially lighten the area, do so at your own risk. To ensure the stains are effectively removed and the dirt and debris is extracted and any odors eliminated, call in the experts of Leading Carpet Cleaning and let our professionals get your carpets clean, sanitized, and deodorized! Ink stains on your carpet that comes from broken pens or even broken sharpies or markers can leave a person with two questions. One is how in the world did ink get on your carpet in the first place, and two, can the stains be removed? 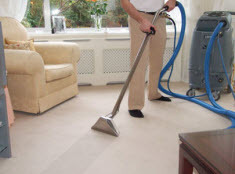 Leading Carpet Cleaning is able to answer one of those questions for you. We will share how you can remove the ink stain out of your carpets. Like any other stain, there are a few ways you can remove ink stains. Leading Carpet Cleaning will share two different methods on how to remove ink stains to help guarantee success. This first method is to use hair spray. Get at least two cans of a lacquer hair spray. Start by spraying the hair spray onto the stain. The hair spray should help soften up the ink to make it easier to remove. Give the hair spray a few minutes to allow the ink to soften, then using a white cloth or towel blot at the stain. Refrain from scrubbing once the ink is softened, as you can actually spread the ink making the stain worse. Repeat using the hair spray and blot at the stain until it disappears. Once the stain is gone, and the carpet is dry, vacuum the area to remove the hair spray and restore your carpet pile. It the vacuum didn’t remove the hair spray you may need to rinse the area with cold water. Dip a clean white cloth in cold water and blot at the areas to remove the hair spray, and then allow the area to dry. Once again vacuum to restore the carpet pile. Similar to the first method, you will use a non-oily hair spray with the aid of rubbing alcohol for more stubborn stains. First apply a small amount of the hair spray onto the stain and then pour rubbing alcohol over it. Allow the two to set on the ink for a few minutes, again to help soften the ink. Next, lightly blot at the stain with a white cloth. As you blot you will begin to see the ink transfer from the carpet to the cloth. You may need to use different points of the cloth to prevent spreading the ink. As the stain begins to disappear, you will need to rinse the area with lukewarm water. Again, dip a clean white cloth in lukewarm water and blot at the area. Once the affected area is completely dry, use the vacuum to restore the carpet pile. Depending on the types of ink that has stained your carpet; the stain may not completely disappear. However both methods should help reduce the appearance of the stains greatly. As an example, permanent markers are actually permanent and can’t be completely removed. However, you can at least reduce the appearance of the stain. Leading Carpet Cleaning provides a wide range of services from carpet cleaning to hardwood floors, area rugs, tile to upholstery cleaning. We also specialize in dryer and air duct cleaning along with mattress cleaning. If our services can help you, don’t hesitate to contact Leading Carpet Cleaning today. When it comes to flooring there are several types that can be used in a home. Some of the most common types of flooring you might find in a home is carpet, hardwood, stone and tile floors. Each of these types of flooring need to be cared for with a particular type of cleaning method. If you want your floors looking good there are several levels of cleaning that need to take place. One is that you need to have a daily plan for all flooring types that need to be done as well as a deeper cleaning. When you care for the flooring in your home they will last a lot of time and look great. The cost to replace the floor is much more than if you were to just care for them and clean them. Cleaning a tile floor takes a good amount of effort to make sure that you have a streak free finish. What is Making Your Tile Floors Black & Dirty: There are several things that can be making your floors dirty. The first happens to be the dirt and dust that gets brought into the house from people and pets that live there. It can be on their clothes and of course their shoes. The dirt is something that will start to collect and many times line the grout of the tile. The other problem comes when you have spills on the floors. Most people know that when something spills on the carpet you have to move quickly to clean it up. The same actually goes when you have ceramic tile. The spills can cause a stain to appear on the tile and the grout as well. It can also cause some damage to the tile and grout if there is acid in the spill. You need to keep spills under control and cleaned right away. Sweep Ceramic Tile Floors: When you are ready to get your tile floors clean it is extremely important to have your floors swept. You need to get all the dirt and debris off the floors before you add any cleaning solution. You can use a broom to sweep up the mess and dustpan it. You can also use a vacuum to clean the tile floors as well. If you vacuum you need to make sure that you have a setting on your vacuum for hard floors. Cleaning with a Mopping Solution: After the floors are swept and cleaned properly you want to mop the floors. You can use a cleaning solution that you make at your home. Get a bucket and add a gallon of warm water. Then mix a cup of white vinegar into the bucket and you can start to mop the floor. This is a great cleaning solution to use if you want a streak free finish. You want to be sure that you rinse out the mop regularly to ensure that the dirt is not being spread around. 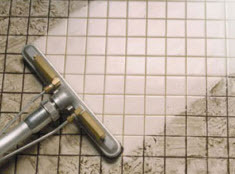 Leading Carpet Cleaning offers professional tile and grout cleaning services and much more. Contact us to schedule an appointment today!